The dark shadow of economic depression fell across the United States in 1931, giving Americans little to celebrate. Soup kitchens, massive unemployment and the Dust Bowl all took their toll on the public’s spirit. But the following year was the 200th anniversary of George Washington’s birth, and officials in our nation’s capital were ready to mark the occasion. The Treasury Department had proposed that a half dollar be struck to honor the birth of the nation’s founding father. Enlisting the cooperation of the Commission of Fine Arts and the Washington Bicentennial Commission, they went ahead with plans for a design competition. Rules announced early in the year called for entries modeled after the “celebrated bust” of Washington by noted French sculptor Jean Antoine Houdon. The bust, created from a life-mask taken at Mount Vernon in 1785, was uncannily accurate and nationally admired. 98 entrants fashioned some 100 designs: Most were amateurish, some were good, but one was exceptional, at least in the Commission’s opinion. It had been submitted by Laura Gardin Fraser, designer of several U. S. commemorative coins and wife of James Earle Fraser, who created the Buffalo nickel. Mrs. Fraser’s powerful, medallic design was far superior to those of her competition and reminiscent of the artistic works produced during the numismatically “golden years” inspired by Theodore Roosevelt. The Commission’s decision was unanimous. Unfortunately, there were other people to please. Initially, Congress got into the act. 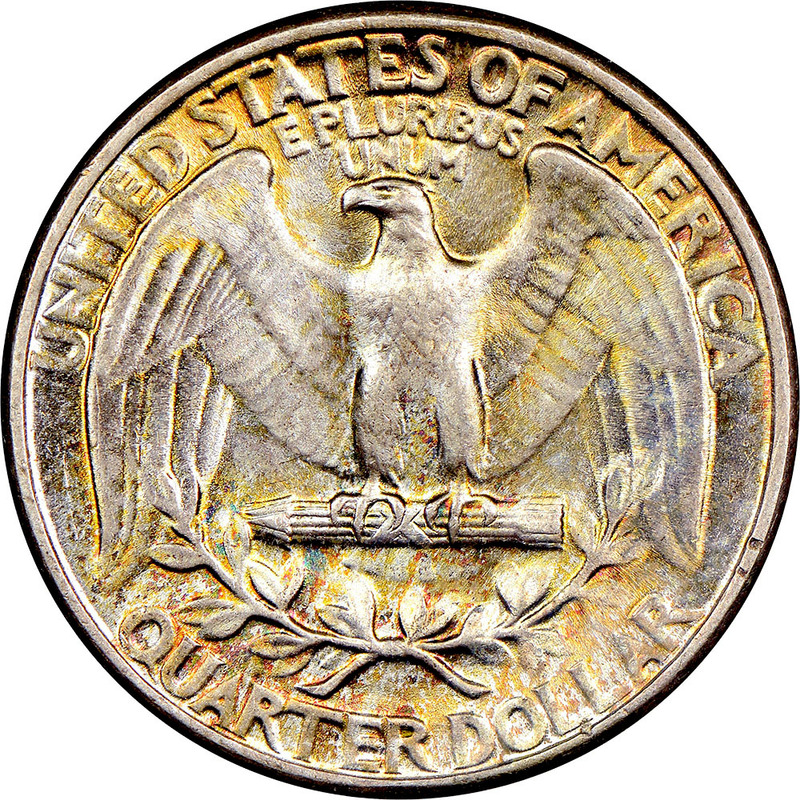 Since changing the design of the half dollar required their approval, once asked they instead decided to change the quarter, thereby signaling an end to the acclaimed Standing Liberty design issued since 1916. No one argued with the denominational change, but a real problem was to arise with the man lawfully responsible for coinage designs, Treasury Secretary Andrew Mellon. Mellon had his own views about art. Rich beyond imagination, he had amassed one of the world’s foremost art collections, along with a reputation for stubbornness which was only exacerbated by his wealth and position. Some would later attribute it to Mellon’s pro-male bias, but he repeatedly refused to listen to the Commission’s pleas for Fraser’s design. Instead he chose one by John Flanagan, a medalist whose earlier works evoked his studies under Augustus Saint-Gaudens, but whose Washington design was an icon of the bland, conservative and frozen images that proliferated (especially in government sculpture) during the Depression. At first, Mellon placated the Commission, calling for a second contest. But ultimately he chose the Flanagan design. While still fielding protests from the advisory panel, he left office to become Herbert Hoover’s ambassador to Great Britain. His successor, Ogden Mills, would consider the matter no further. He brusquely reminded the Commissioners that they had a purely advisory role and that the final decision fell upon the Treasury Secretary, not the Commission. Flanagan’s design was simple but not especially well suited to medallic art. Washington faces left and dominates the obverse, with the date below and LIBERTY above. The motto IN GOD WE TRUST is in the left field, with the designer’s initials on the base of the neck. A spread-winged heraldic eagle adorns the reverse, encircled by UNITED STATES OF AMERICA and E PLURIBUS UNUM above, and QUARTER DOLLAR and a wreath below. Mintmarks are found below the wreath on coins dated 1964 and earlier, and just to the right of Washington’s braid on issues beginning in 1968. From a production viewpoint, Mint officials must have loved the design. 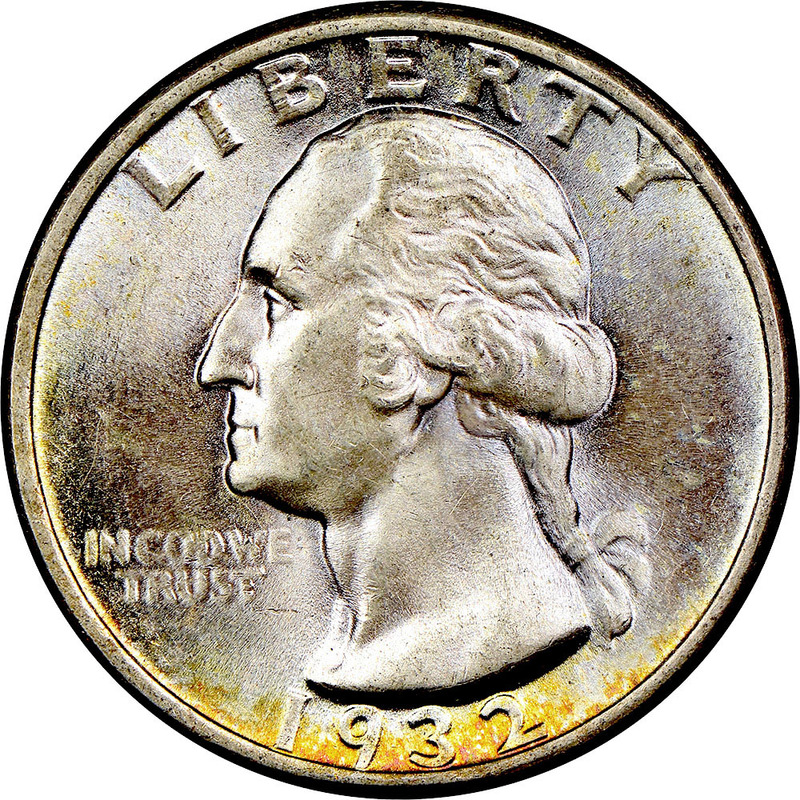 With such low relief, coins could be rapidly struck with only one blow from the press. The drawback, however, was not only an artistic loss, but the weak design elements required periodic alterations to the master hub. The motto was so weakly defined in 1932 and on some issues of 1934 that it could barely be read, even on uncirculated coins. There have been three significant changes in the series since its inception in 1932. In 1965, the composition was changed from 90% silver to a clad or “sandwich metal” of 75% copper and 25% nickel, bonded to a pure copper core. The second modification came in 1975, when Jack Ahr’s Bicentennial “Drummer Boy” design appeared on the reverse, with the dual-date 1776-1976 on the obverse. In 1977, the regular design returned. Beginning in 1999, however, the Washington quarter will be changed no less than five times per year through 2008, as each of the fifty states is commemorated on the quarter’s reverse. The statutory legend UNITED STATES OF AMERICA and the value QUARTER DOLLAR have been relocated to the obverse to provide space for the distinctive reverses. Whether the old type will resume after that time is still uncertain. Continually gaining in popularity with collectors, Washington quarters are usually assembled by date and mint. Coins were issued every year except 1933. Although not rare, the low mintage 1932-D and S quarters are considered scarce issues, along with Mint State 1936 Denver coins which, despite their large mintage, somehow escaped the hoarder’s nets. Fortunately for today’s collectors, the renowned dealer Wayte Raymond and others were quite diligent in their accumulation of bank-wrapped rolls in the ‘30s, a time when most people couldn’t even afford the $10 cost of a single roll. Many Americans didn’t have a job, and most who did only made about $20 a week. Since 1932, billions of regular and proof Washington quarters have been coined. Production has taken place at four mints: Philadelphia, Denver, San Francisco and West Point. Although collectors are focusing more attention lately on the business strikes, proofs have always been favorites, particularly the 1936-1942 issues and the scarce cameo-proof coins of 1950 to 1964. Since 1968, all proofs have been struck at the San Francisco Mint. Earlier proof coins emanated from the Philadelphia Mint. Washington quarters are collected in all grade ranges but are especially popular in Mint State. With so many coins struck from so many dies, repunched mintmarks, over-mintmarks and hubbing errors abound, making the series a fertile field of study for those delving into the intricacies of modern coinage production. Grading this type is fairly simple. Wear on the design will first show on Washington’s hair at the ear and on the center of the eagle’s breast. Struck counterfeits exist, but collectors are more likely to encounter added mintmarks, especially on the 1932-D and 1932-S issues. Authentication of any questionable specimen is highly recommended.